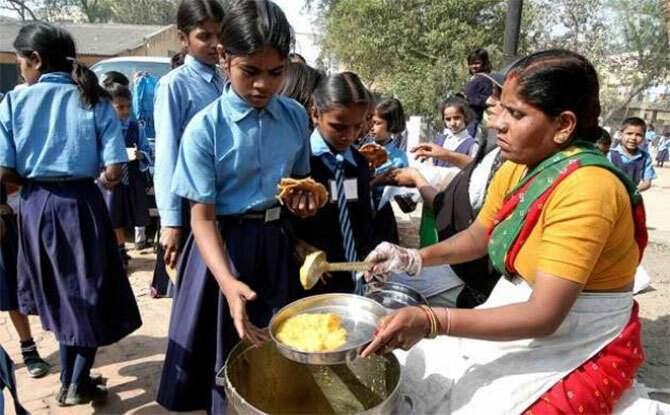 Rediff.com » Business » Should Aadhaar card be linked with midday meal? Should Aadhaar card be linked with midday meal? Effective July 1, 2017, a student without the Aadhaar ID would not be fed the midday meal given free in school. The Supreme Court has clearly prohibited the mandatory usage of the Aadhaar for government incentives. The idea of a midday meal is to ensure basic nutrition to schoolchildren. Corruption in the scheme may have nothing to do with fake children being shown to siphon out money, says Somasekhar Sundaresan. A new storm is brewing. After demonetisation, it is the backdoor enforcement of Aadhaar identification for children to qualify for midday meals. The move is threatening to take the shape of the next direct conflict between academic policy implementation and the practical problem of unintended consequences on the ground. Added to the mix is the evident violation of the Supreme Court’s orders that Aadhaar cannot be made a mandatory requirement for government welfare schemes. While midday meals are the most emotive of the schemes to which the unique identification under Aadhaar has been made mandatory, Business Standard has reported that 14 similar notifications have been made under 11 schemes, including schemes involving access to primary and secondary education. Interestingly, the news was broken not in the “mainstream” print media but by online paper Scroll.in. Effective July 1, 2017, a student without the Aadhaar ID would not be fed the midday meal given free in school. “Individuals desirous of availing the benefits under the (midday meal) scheme offered at the schools are required to furnish proof of possession of Aadhaar number or undergo Aadhaar authentication,” reads the gazette notification. This is a disastrous approach. Indeed, there will be arguments for it. Some of the usual ones are about leakage of government welfare - small doles to the poor somehow make bigger news that large-scale subsidies and tax concessions that get routinely abused. According to reports, at least 100.3 million elementary students from the first to eighth standards, studying in 1.15 million schools benefit from the midday meal scheme. The scheme also provides part-time employment to an estimated 2.53 million workers for implementation of the scheme. Midday meals are provided to school children under the food security law, substantially using central government funds granted to state governments and then down to local municipal governments that run schools. The costs are shared broadly in a 60:40 ratio in most states and in the north-eastern states and in Himachal Pradesh, Uttarakhand and Jammu and Kashmir in a 90:10 ratio. Central government funding in the last Budget for this is a mere Rs 10,000 crore (Rs 100 billion), with a marginal increase of Rs 300 crore (Rs 3 billion) since the last Budget. The idea of a midday meal is to ensure basic nutrition to schoolchildren since it is under-nourishment that essentially leads to lack of absorption of education in formative years. There is no credible and rigorous evidence of any material leakage under the scheme. Every scheme, public or private, will be gamed to see if benefits can be wrongly extracted. If the response to any leakage, real or potential, material or immaterial, is to indulge in carpet-bombing by threatening the very scheme, we will soon have another demonetisation-type problem on our hands. Crooks will find a way to get around the solution and many genuine and sincere beneficiaries could be put to avoidable hardship - akin to burning down a house to kill a few insects that have entered it. Also, akin to US President Donald Trump’s ban on entries from seven Islamic nations, which would have kept even US nationals and residents out of the US if they happened to be outside the country when the ban was sought to be imposed. Worse, the Supreme Court has clearly prohibited the mandatory usage of the Aadhaar for government incentives except for specific schemes that the court permitted. In short, in this case, there is already a restraining order from the judiciary on such usage of Aadhaar. Yet, the government has brazened it out. The ball will now be literally in the Supreme Court. Last heard, lawyers appearing in the challenge to such use of Aadhaar have been pushing for an early hearing of the privacy concerns arising out of the Aadhaar implementation and the court has been struggling with bench strength issues to constitute a bench to hear the matter. However, the introduction of new mandatory requirements to quote Aadhaar could lead to contempt proceedings, too. Indeed, there could emerge problems with implementing the midday meal schemes. For example, as some experts point out, corruption in the scheme may have nothing to do with fake children being shown to siphon out money. In fact, the leakage would be in terms of substandard food being given, or companies that make and sell pre-packed and processed food seeking to get their products approved as substitutes for midday meals (there have already been reported attempts of the government nearly approving biscuits in place of midday meals). Insisting on Aadhaar can never fix such leakages and corruption. Therefore, before doing something drastic such as asking children to go hungry if they do not have an Aadhaar card, there has to be an empirical basis to demonstrate that the proposed solution is necessary for a clearly-perceived and real problem. Without a problem statement being defined, enforcing a good-to-have-and-feel-good “solution” would come quite close to declaring that 85 per cent of live currency stock would cease to be legal tender.